“For the Word of God is full of living power…It exposes us for what we really are” (Hebrews 4:12). 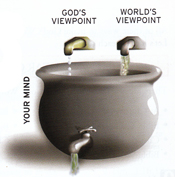 Every moment of every day, your mind is flooded with information…most of it the world’s viewpoint. Your life, and the decisions you make are greatly influenced by what goes into your “Vat”! In order for God’s viewpoint to prevail in your life, you must get a good “dose” of God’s Word…not just a few minutes each day. Q How does Colossians 3:16 apply to you personally? All of these ways to make God’s Word a bigger part of your life are important. Let’s look at each of them. Q How are you hearing God’s Word taught, and what can you do to increase hearing it? Q Hearing God’s Word should make you want to read and study it for yourself. What does Acts 17:11 say? Whenever you hear God’s Word taught, attempt to learn what the Holy Spirit is trying to teach you personally, taking good notes, and writing down your thoughts.